Mr. Hidetsune Takamine is a well-known Okinawan ant expert who has been collecting ants in Okinawa for around 40 years. His collection includes 116 species, 30 of which are endemic to Okinawa. 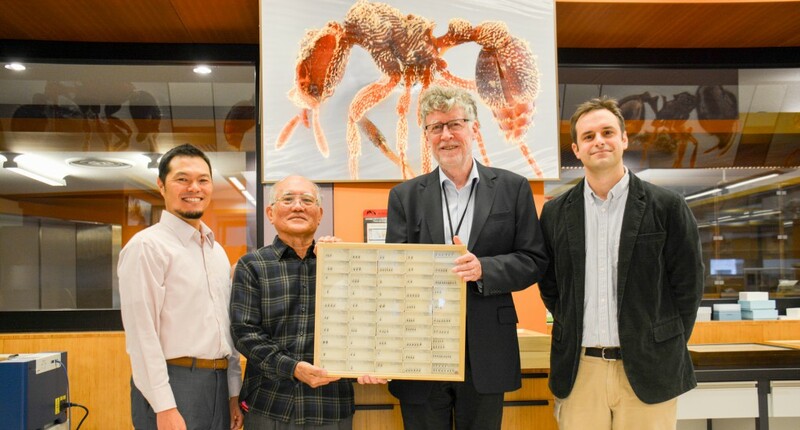 On November 26, 2015, Mr. Takamine donated his ant collection to OIST at a handover ceremony that took place at the Biodiversity and Biocomplexity Unit and will be stored in the unit’s specimen shelf as the Takamine Collection. Dr. Masashi Yoshimura and Prof. Evan Economo expressed their gratitude towards Mr. Takamine, emphasizing how much this donation would contribute to academic research and more specifically how it would improve the scientific research on Okinawan biodiversity and help us understand how the diversity of Okinawa fits into the broader picture.